The bizarreness of the message led many to believe that the message was posted by someone else and TechCrunch reported about it. 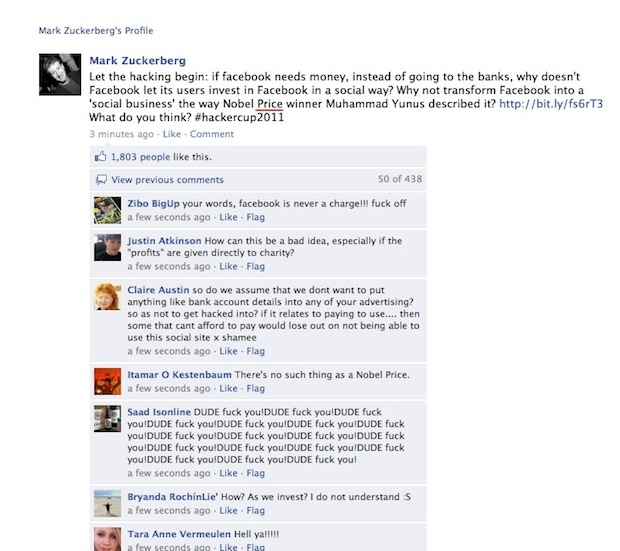 The #hackercup2011 hashtag many mean that it was done by some disgruntled participant of Facebook Hacker Cup 2011. Many participants were not pleased with the way Facebook handled the event. After words got out that the page has been hacked, Facebook has disabled the page. Here is a screenshot of the status update taken by TechCrunch. By the time they took the screenshot, the status update had already got more than 400 replies and 1800 likes.